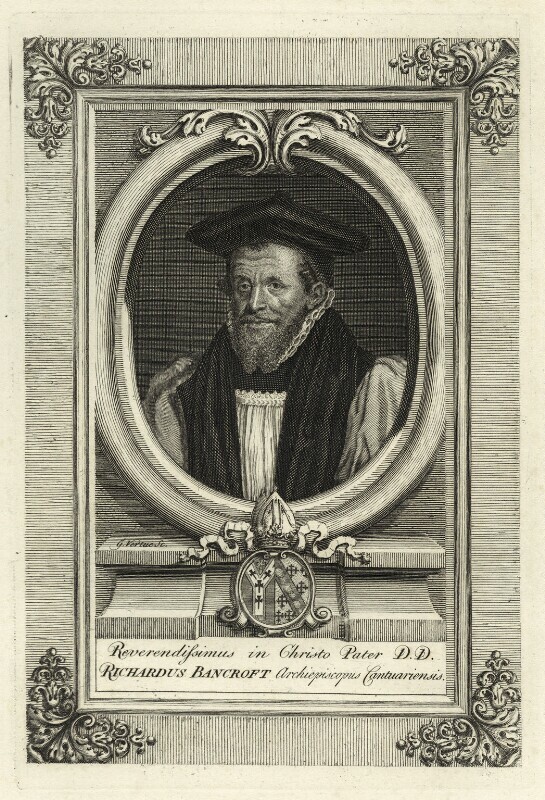 Richard Bancroft (1544-1610), Archbishop of Canterbury. Sitter in 5 portraits. Second Jacobite Rebellion: the Young Pretender, Charles Edward Stuart ('Bonnie Prince Charlie') lands in Scotland and proclaims his father king. Jacobite forces take Edinburgh and march into England as far as Derby but are forced to turn back due to lack of support. The song later to become the British national anthem, God Save the King, is first performed at the Drury Lane Theatre in London in a setting by Thomas Arne. William Hogarth completes the six paintings of Marriage-à-la-Mode, his satirical take on upper-class eighteenth-century society. Satirical writer Jonathan Swift dies. War of the Austrian Succession: the French army defeat Austrian, Dutch and British forces under the Duke of Cumberland at the Battle of Fontenoy. Madame de Pompadour becomes mistress to Louis XV of France. Principle of the Leyden jar is discovered by German physicist, Ewald Georg von Kleist. Artist Giovanni Batista Piranesi publishes the first of his Vedute (Views); a celebrated series of etchings of Rome.